Great for stores, offices & more! Installs easily on any door but will not work on a metal door. 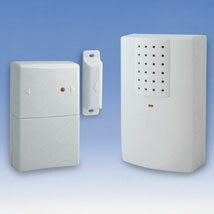 The commercial magnetic door chime operates on one 9 volt and two C batteries (not included). Chimes when door opens and magnetic sensor is separated. Features wireless transmitter so you can take it with you up to 165 feet. For many more products, we encourage you to take a moment to view our entire selection of Door Alerts at Specialty Store Services now.